The T32.xS temperature transmitter from WIKA, developed for a wide range of applications in industry, is now available with a variant certified for SIL2 applications and for redundant use for SIL3 applications. The specific qualification of the temperature transmitter for use in protection systems has been certified by TÜV Rheinland after successful auditing. There are only two such transmitters, worldwide, which conform to the defined stringent procedure "Full Assessment in accordance with IEC61508". Previously field devices of this type were only evaluated through their operational reliability and/or their failure statistics and for SIL applications declared with the attribute "proven in use". The new procedure "Full Assessment in accordance with IEC61508", in contrast, determines and certifies the qualification for protection systems in accordance with strict rules, which already include the design and development process and require the consistent use of professional, high-end tools for quality assurance. 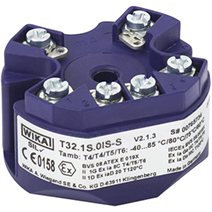 Alongside comprehensive internal failure monitoring, the T32.xS temperature transmitter offers a dual sensor functionality with automatic redundancy changeover, integrated drift detection and exceptional compatibility with almost all standard software and hardware tools.